Information and advice about Leopard's and Snow Leopard's new and changed networking services. Advanced Access History window displaying all logged access attempts and including security risk level and host name of the accessor. Advanced filtering options that let you only display specific sets of logged access attempts. 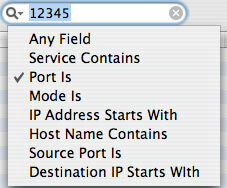 Windows summarizing access attempts by service type and accessor IP address. Find command to search for any data in any of the main windows. Built-in information and advice about many common attacks and their applicability to the Macintosh. Automated "Whois" lookup to determine details of the accessor's network, including administrator name, address, phone number and email. Geo-location and mapping of accessor's physical location. Automated drafting of an email that can be used to notify the administrator of the access attempt and provide the administrator with details that may be useful in tracking the attempt. An integrated copy of our book "Internet Security for Your Macintosh and iPhone", accessible on a servivce-by-service or section-by-section basis. Direct integration with our security blog, Twitter stream and Top 10 list to help you get the most up-to-date information. Direct integration with our DoorStop X Firewall. Open Door's DoorStop X Firewall. Symantec's Norton Personal Firewall for Macintosh (3.0 or later). The firewall built into Mac OS X Server, the Flying Buttress shareware firewall, and any other firewall that uses Mac OS X's built-in firewall logging capabilities. View the firewall's log in non-cryptic form. The firewall does not log successful access attempts to your Mac. Use Who's There? to notice and analyze critical attacks based on other data. Prevent firewall log data from being reset every week. Who's There? does not support the firewalls built into Leopard (10.5) or Snow Leopard (10.6), which contain insufficient logging to be of any use. It does support Leopard and Snow Leopard Server. Copyright (C) 2000-2009, Open Door Networks, Inc. Who's There? Firewall Advisor and DoorStop are trademarks of Open Door Networks, Inc.